Here are 5 open source diagram software for Windows. With these software, you can make various types of diagrams. You can make Block Diagram, Activity Diagram, Use Case Diagram, Class Diagram, Network Diagram, Flow Chart, UML Diagram and more. All these software are straightforward and easy to work with. 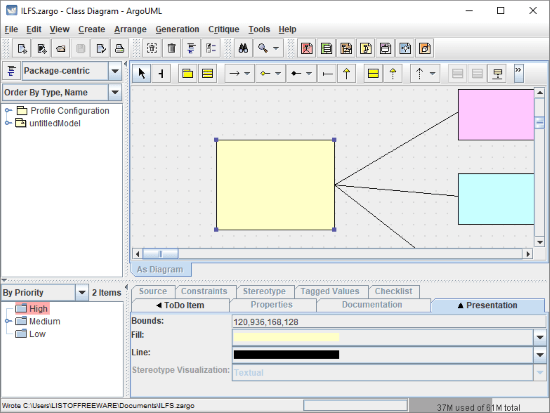 They have a toolbar at the left side of the screen which contains various types of diagram shapes. You can simply drag and drop those shapes to the canvas and adjust them accordingly. After making a diagram, you can export that to various files types including PNG, JPG, SVG, ODT, HTML and more. These software also feature some additional perks to boost your productivity. So, let’s discuss them one by one and see what they offer. 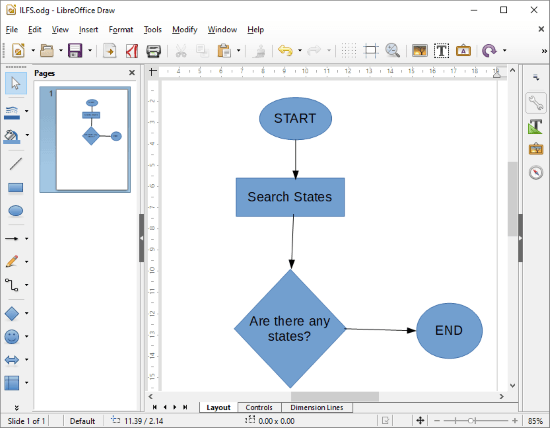 Dia is an open source diagram software for Windows. With Dia, you can make Flowchart Diagrams, Network Diagrams, ER Diagrams, Use Case Diagrams, UML Diagrams and many other types of diagrams. The user interface of this software is simple and easy to navigate. It has a toolbar on the left side along with another toolbar at the top and the rest is the canvas area. The left side toolbar has a set of essential diagram tools, such as shape drawers, line drawers, text, magnifier, etc. accompanied by a category of diagram specific tools. The toolbar at the top has basic software options such as Save, Save As, Export, Magnify, etc. The canvas here has a grid layout with the ruler marked on both sides. You can simply drag a shape from the toolbar and add it to the canvas. Then, you can resize the shape and add text to it. You can open multiple tabs in this software and copy-paste content from one tab to another. After making your diagram, you can export it as a Dia project or export in various file types including JPG, PNG, TFF, SVG, BMP, PDF and more. You can download this open source diagram software here. Pencil is a free open source prototyping software. Using this software, you can create various types of activity diagrams along with prototype flow charts for iOS, Android, websites and desktop applications. Pencil has very intuitive Interface with all the tools on the left and canvas on the right. The tools section is divided into three tabs, one for built-in shapes, one for uploaded shapes and one for clipart. The Shape tab contains sets of Common Shapes, Basic Web Elements, Desktop GTK Widgets. Desktop Sketchy GUI, Flow Charts, Android ICS, iOS UI Shapes and more. 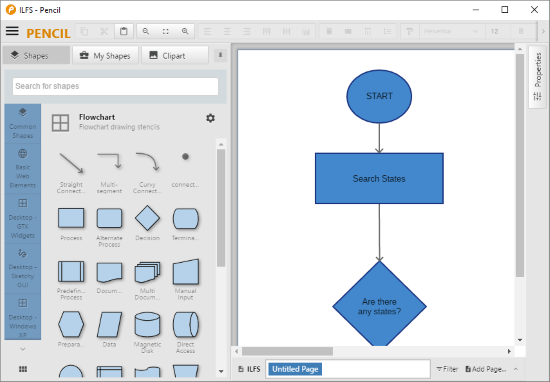 In the My Shape tab, you can upload your own set of shapes and use them in the diagram. Whereas, the Clipart tab has integrated OpenClipart.org where you can browse thousands of clipart and use them in your diagrams. Making a diagram is very easy with this software, you can simply drag the shapes from the tools to the canvas, resize it there and add text. Then, you can use the connections shapes from the Common Shapes to connect the shapes. You can change the alignment of text, change line style and rotate it as well. You can also use various color for text here. After making your design, you can save as a Pencil project or export it as PNG, SVG, HTML, ODT or PDF file. You can read a more detailed article on this software here. Download this open source diagram software here. 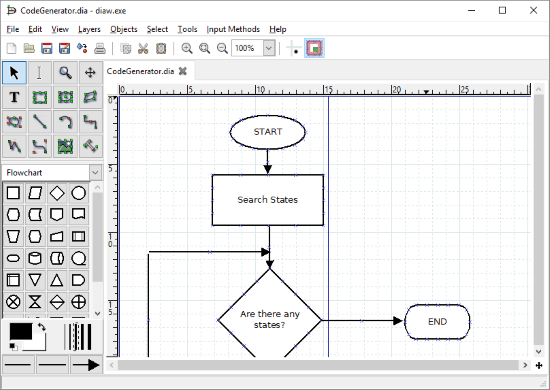 As the name suggests, Dynamic Draw is a diagram software that has a dynamic toolbar. This software has multiple toolbars for various types of diagrams. When you open this software, it asks to pick a diagram template and loads relevant set tools based on your selection. With Dynamic Draw, you can make Flow Chart Diagrams, Block Diagrams, Network Diagrams, Activity Diagrams, Use Case Diagrams, UML Diagrams and more. The user interface of this open source diagram software is a little complex. It has four toolbars on the left side and various text-related options at the top of the canvas. The first toolbar contains different file-related options along with copy & paste. Second toolbar contains snapping and selection tools. The third toolbar contains the essential drawing tools such as Rectangle tool, Arc tool, Rotation tool, etc. And the fourth section has selected diagram related tools. With all these tools, this software has a learning curve but once you know your way around it’s not hard to use. Here is a link to download this open source diagram software. Apart from that, you can also create a do to list with three priority options. The tools here are present at the top of the canvas arranged by their respective types. You can simply select a tool from there and use it to make your diagram. After making the diagram, you can save it as a PNG, SVG, GIF, PS, EPS, XML or PDF file. LibreOffice Draw is a part of popular open source LibreOffice suite. 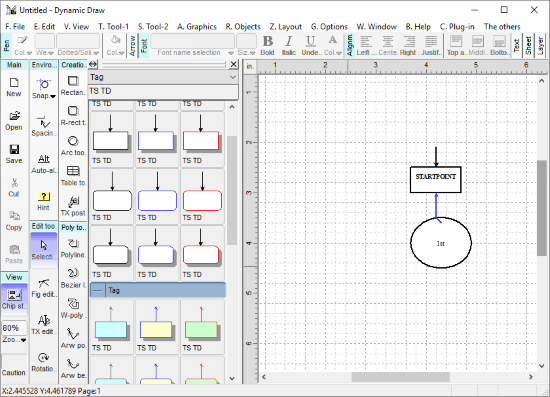 This software packs a bunch of diagram tools which you can use to make various types of diagrams. With these tools, you can make Flow Chart Diagrams, Line Diagrams, Activity Diagrams, Class Diagrams, Use Case Diagrams and other types of block diagrams. All these tools are arranged in a toolbar present on the left side. You can select a tool from there and draw the respective shape on the canvas. There is also a Pencil tool to write markdown points and a Paint Bucket to fill colors in shapes. And, you can also add images to your diagram here. The canvas has the ruler marked on two sides. Right to the canvas, there is a Properties tab where you can save names, dimensions and select various text options for a select shape. After making your diagram here, you can export it in various formats such as DOC, GIF, TIFF, SWF, PDF, etc. These are the 5 open source diagram software for Windows. Using these software, you can easily make various types of activity diagrams and export them in desired formats.